Few things sound better in life than sipping Champagne in the actual Champagne region of France. For years, I had visions of doing just that. I imagined myself, relaxing on a veranda overlooking the revered vines that make this region famous. Perhaps there would be some classical or French bistro music playing in the background as I sat, contentedly downing another glass of the sparkling elixir as the sun slipped beneath a distant hill, my flute casting long shadows on the table. As you feel warmed by my picture-perfect imagination, I need to explain that the actual experience is a far cry from this. We enjoyed our time in Champagne, but perhaps if I had a better idea of what the experience would hold before I went, I might have enjoyed it even more. Traveling is all about managing expectations correctly; if you don't understand what to anticipate, it's easy to be unnecessarily disappointed. So take my advice and visit, but just understand the process. First of all, any ideas of tasting wine overlooking a vineyard should be squashed immediately. If you're looking for this, you need to know an individual grower or visit a vineyard in Italy or California. Champagne, by nature, isn't like other wines that are produced from a single estate and named for that vineyard, region, or production year. Almost every champagne is made from a ratio of Chardonnay grapes, Pinot Meunier and Pinot Noir grapes, all coming from different growers from different villages in the Champagne region, called crus, and graded by their quality of grapes (Grand Cru, Premier Cru, etc.). The actual wine is produced in town at a Champagne house - where a master winemaker buys grapes and perfects the wine in chalk caves deep below the surface of a grand building. My husband, Nick, and I drove from Paris through the French countryside to experience the city of Reims (pronounced Rahns), one of two larger towns in the Champagne region (the other being Epernay). And while Reims boasts beautiful architecture and some ancient, historically-significant buildings (Saint-Remi, Notre Dame, Mars Gate, etc. ), much of it was destroyed during World War II and reconstructed, giving it a less-quaint feeling than most European villages. And while you might also expect a town that houses the most exclusive Champagne houses in the world to be incredibly posh, it's actually a college town drumming with students, where you're more likely to hang out in bars at night with raucous kids. And good luck finding Champagne to drink at a bar or restaurant. I'm not kidding, it's really difficult to get a glass of Champagne anywhere. I never pictured myself drinking Belgian beer in Champagne because I gave up searching in vain for a Champagne bar, but it's the truth. But I tell you all this, not to discourage you from visiting, but just so you understand what it will be like. 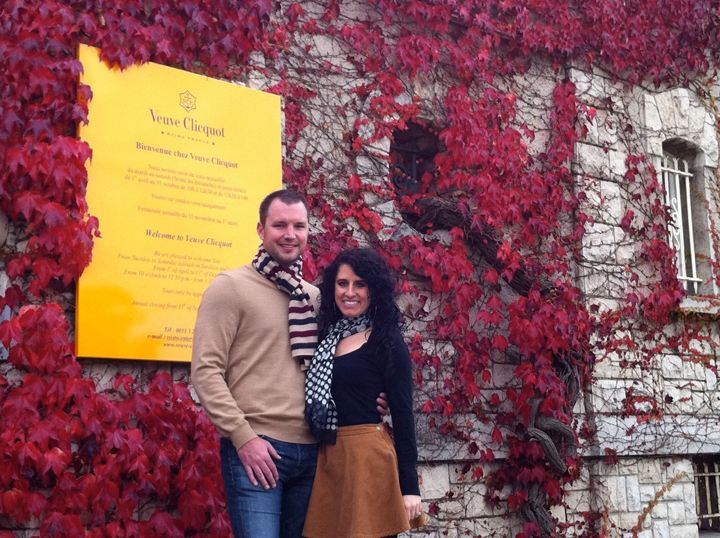 We did have our moments of glamor, and learning about the process of Champagne was fascinating. 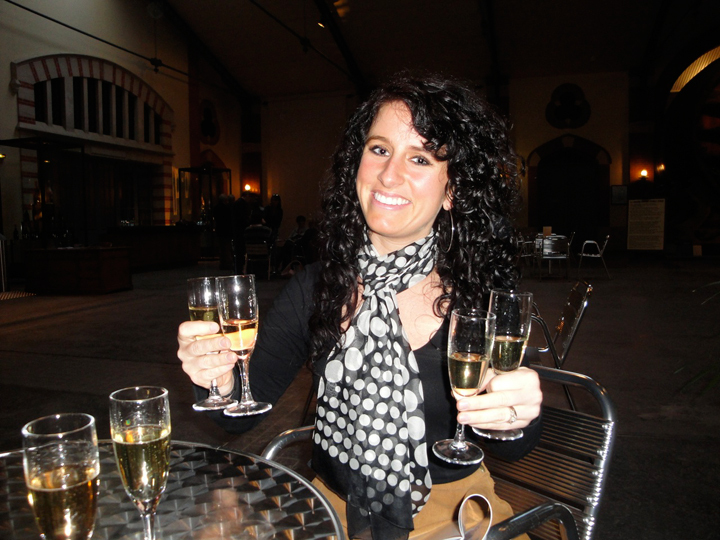 And I rarely have a bigger smile plastered on my face than when I had 2 glasses of $50+ bottle Champagne in each hand. When planning your trip, one of the first things you need to do is decide which town you will visit (Reims or Epernay) and begin your research on the Champagne houses that are located there. It is imperative to schedule your English tours BEFORE you go, as slots and times fill up quickly. Since we chose Reims, I immediately knew Veuve Clicquot Ponsardin would be near the top of our list. A sommelier that I am acquainted with in Cincinnati (Kevin Hart of Boca) highly recommended Ruinart, but even one month out, I could not secure an appointment; they were completely booked up. I ended up making appointments at both G.H. Mumm and Taittinger as well. Another thing you should be aware of is that Champagne houses do not permit tastings without a full tour. The tours cost about 15-30 EUR per person, depending on which level of Champagne you want included in your tastings (basic cuvee, vintage, etc.). The tour takes about 1 hour and includes a history of the house, a tour of the chalk caves and how Champagne is made. As much as I loved learning about the process, once you see one chalk cave, they all begin to look the same, and I wish that the houses gave the option of skipping the tour and going straight to bottle-popping. There is ONE Champagne house that will permit this: Pommery, located right down the street from Veuve Clicquot. Dressing Tip: Be sure to dress appropriately, because no matter if it's 80º outside, the chalk caves stay a constant 53º all year, which make them perfect for aging and storing wine. On day one, our first visit was at Veuve Clicquot Ponsardin, where we learned about the spunky widow who changed the face of sparkling wine. We were surprised at how much influence women had on the evolution of the Champagne process, especially when you consider that this happened during the 1800's. We loved learning about the Crus, the fermentation process, bottling, riddling, and what a vintage was. 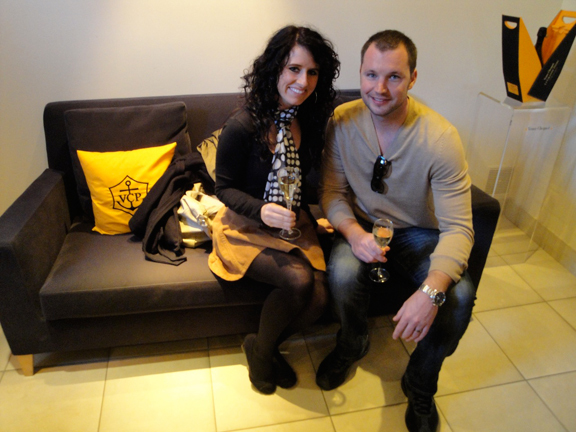 The tour concluded in the posh Veuve Clicquot store, where a tasting was conducted. We were lucky enough to have a glass of the Vintage 2002, which was excellent. From Veuve, we ventured north along the Boulevard Diancourt to Pommery, a beautiful gated property with fortress-like buildings. This is where we were able to waltz in without an appointment and opt for a tasting only, no tour necessary. We selected a tasting where Nick and I each had four slightly smaller glasses of bubbly to try. The four featured wines were the Brut Rosé, the Summertime (made from Chardonnay grapes only, it was very light and delicate) the Wintertime (made from Pinot Noir grapes only and has an intense, rich flavor) and the Grand Cru Vintage 2004. I loved them all in their own ways, but I think the Wintertime and the Vintage were my absolute favorites. After that, we headed back to the center of town to Le Colibri (12 Rue Chanzy), a restaurant and piano bar that ACTUALLY served Champagne, just in front of Notre Dame cathedral, where I enjoyed a glass of recognizable Champagne for 10 EUR. I'm serious, almost every establishment we went to did NOT have Champagne, it was almost inconceivable! From there, we went on to Pub l'Escale (132 Rue de Vesle), a Belgian beer bar that is popular with locals. And those locals are mostly students. But our bartender was fantastic and Nick and I enjoyed sampling beers. The next day, we almost missed our appointment at G.H. Mumm as we got horribly lost, but thankfully made it in the nick of time. I have to admit, I was less interested in our tour, not because Mumm wasn't interesting, I just think there are only so many times you can listen to the winemaking process and walk through moldy chalk caves. Yes, penicillin grows on the walls of the caves, so I suggest you pop a Zyrtec or Allegra before the tour. The tasting was conducted in a tasting room (novel idea!) which was nice, but again, this is one of the issues I had with the whole experience. I wanted to either be out on a veranda with a view or in a sumptuous parlor listening to music. Nick and I tried the Mumm Cordon Rouge and the Vintage 2004. I especially loved the vintage, of course. After Mumm, we enjoyed a stroll across town amidst the autumn leaves and made our way to Taittinger for our final tour and tasting. I've always loved the old posters for Taittinger. I gritted my teeth to endure another tour and held out for the tasting, because at least it's a nice payoff. We bought a bottle to go and retreated back to our hotel to enjoy in our room as we readied for dinner. We chose Edgar, a stylish bistro which was in the quaint Place de Forum (4 Place Forum). We dined on succulent steaks with béarnaise sauce and french fries and enjoyed a bottle of local white wine. After that, we headed back to Pub l'Escale for a Belgian beer nightcap. Overall, we enjoyed our time in Reims immensely, although, as I said before, I had to change my mindset. We only visited four of the numerous Champagne houses, but if I were to return, I would also visit Ruinart, Piper-Heidseick, Krug and Lanson, among others. If going to Epernay, I would try to hit Moet & Chandon, Perrier-Jouet and Nicolas Feuillate. Reims IS quite lovely, but like I said, it's best if you know what to expect. Yum, I could really use a glass of bubbly right now! Cheers! Viewed 8035 times so far.